Ancestry: Ezra Freeman Crowell; Benjamin Crowell; Benjamin Crowell; David Crowell; Joseph Crowell; John Crowell; John Crowell; John Crowell. Born: September 20, 1849 in Falmouth Ma. 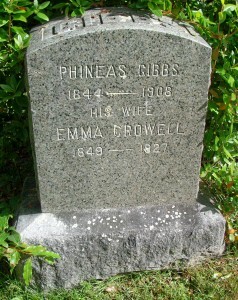 Died: August 15, 1927 in Bourne Ma. at 77 yrs, 10 mos, 26 d.
Where Lived: 954 County Rd. in Cataumet Ma. Married: January 6, 1874 in Waltham Ma. 1. 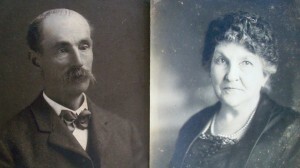 Mabel Howland Gibbs Wing; (March 31, 1875 – April 22, 1969); Married Lester Waldo Wing (1871 – 1938) (Oliver Cromwell Wing & Delilah Ophelia Kendrick) in Cataumet Ma. on December 17, 1902; They had 1 child; Mabel & Lester are buried in Cataumet Cemetery. 2. Seabury Corey Gibbs; (November 10, 1877 – March 25, 1961); Married Priscilla Myrick Hill (1882 – 1975) (Samuel Plumley Hill & Mary/Emma Awilda Phinney) in Bourne Ma. on November 27, 1901; They had 2 children; Seabury & Priscilla are buried in Cataumet Cemetery. 3. William A. Gibbs; (April 24, 1880 – August 26, 1880); William died at 4 mos, 2 d..
4. Sylvia Alma Gibbs Avery Rogers Alger; (February 3, 1883 – July 15, 1968); Married (1) George Taylor Avery (1881 – 1970) (Walter S. Avery & Frances/Fannie L. Baker) in Cataumet Ma. on December 27, 1903; No children; They divorced; George married (2) Anna R. Schneider (1885 – 1954) (Robert A. Schneider & Margaret Kegal) in Pocasset Ma. on June 16, 1914; Sylvia married (2) Leslie Blossom Rogers, (twin) (1882 – 1926) (Zemira B. Rogers & Melissa J. Small) in Brockton Ma. on November 29, 1911; No children; She married (3) Sanford Edward Alger (1878 – 1957) (Charles Sanford Alger & Ellen F. Dunbar) prob. in Brockton Ma. ; No children; Sanford married (1) Jennie May Jackson (1880 – 1944) (Charles Henry Jackson & Helen L. Whiting) in Brockton Ma. 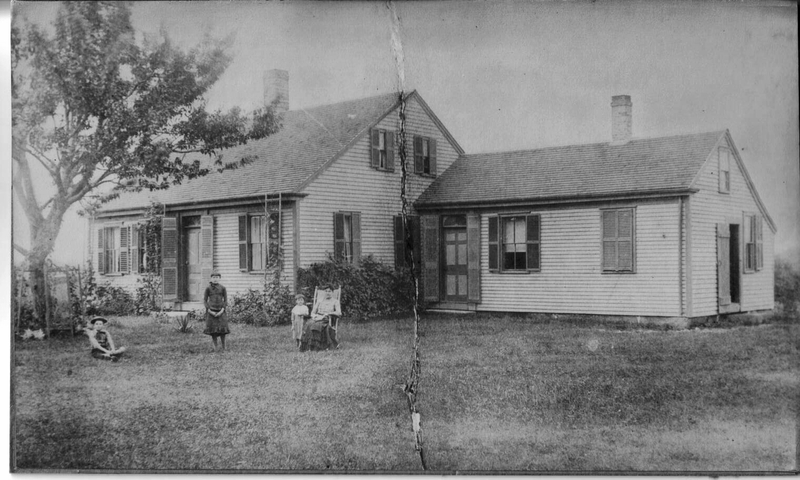 on November 5, 1900; Sylvia died in Brockton Ma. at 85 yrs, 5 mos, 12 d.; She, Sanford & Jennie are buried together in Melrose Cemetery in Brockton Ma,; George & Anna are buried in Pocasset Cemetery; Leslie is buried in Brewster Cemetery in Brewster Ma. with his parents.